Contact Julia Gogoleva, the PR4PR organizer at julia.gogoleva@gmail.com. 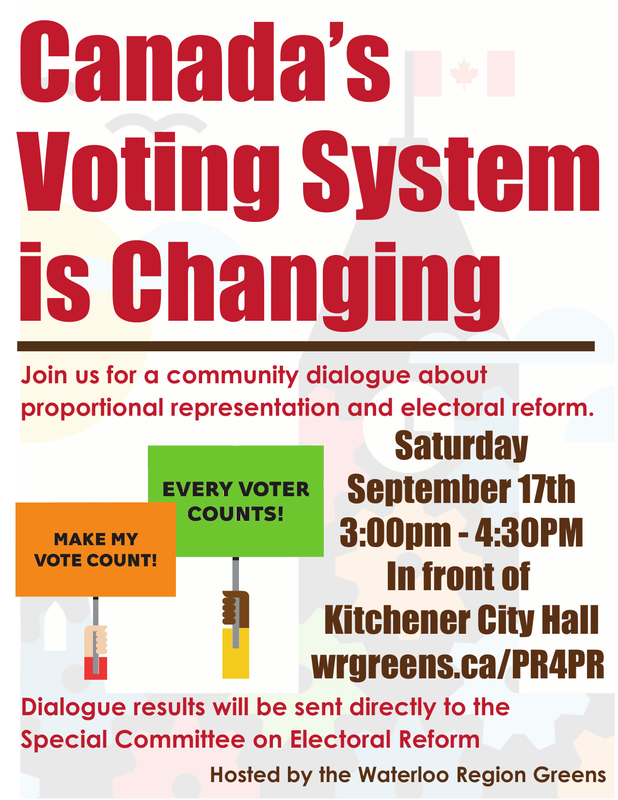 All five MPs in Waterloo Region are teaming up for this multi-constituency consultation. We need you to commit now to attend this most important of consultations! We’ll show our support for the People’s Climate Plan. Organizers with the People’s Climate Plan are calling for the national climate strategy that respects climate science and Canada’s commitments in the Paris Agreement, ensures a plan to transition to 100% renewable energy by 2050, and enshrines justice for all workers and Indigenous communities. EVERYONE needs to come to this important event. This is a multipartisan event that is the result of collaboration of many different groups. Both Liberal and Conservative MPs will be in attendance, with GPC and likely NDP folk helping to facilitate. As previously mentioned, two very contentious resolutions were put forward at the 2016 Green Party of Canada Convention. Even if you were unable to attend, you can watch recordings of The Real News Network’s livestream in a convenient WRGreens YouTube playlist. During the resolution workshop on Saturday, a proposed amendment to the “Revoking the Charitable Status of the Jewish National Fund Canada (JNF)” resolution that would remove any mention of the JNF, making it generic was put forward, but voted down because it substantively changed the original intent of the amendment. The workshop voted to pass the original resolution and send it on to a plenary vote, where the amendment was reintroduced and pushed through. The Palestinian Self-Determination and the Movement for Boycott, Divestment and Sanctions resolution was indeed grounds for spirited debate, both in the workshop and the plenary. Because both resolutions dealt with Isreal, the chief arguments against them were accusation of antisemitism. As I understand it, since they were announced there was a strong campaign to stop both resolutions. The idea that any Canadians should be prevented from even discussing human rights is reprehensible to me, personally. What it boils down to is that sanctioning a nation that uses its power to commit human rights violations against a captive population is a defense of human rights, not an antisemitic attack. This is a human rights issue, a sphere in which Canadians used to aspire to lead the world. Foreign policy does not enter into it. “The Green Party of Canada delegates have just voted to endorse Boycott, Divestment and Sanctions (BDS) against the Israeli government at the federal convention in Ottawa! Congratulations to all the party members, who worked hard to advocate for human rights in the face of harsh criticism, intimidation and smear campaigns carried out by the Israel lobby. The way [Green Party president, Ken] Melamed sees it, the fact the issue was being debated at all was a sign of how democratic the Green Party is. Other political parties don’t even touch topics like these, he suggested. If grassroots within the Green Party of Canada membership want to debate something and bring it into the policy book — no matter how controversial — there’s nothing stopping them. BE IT FURTHER RESOLVED that the GPC will support such a form of BDS until such time as Israel implements a permanent ban on further settlement construction in the OPT, and enters into good faith negotiations with representatives of the Palestinian people for the purpose of establishing a viable, contiguous and truly sovereign Palestinian state. BE IT FURTHER RESOLVED that the GPC opposes all efforts to prohibit, punish or otherwise deter expressions of support for BDS. The article CJPME: GREEN PARTY BDS RESOLUTION SUPPORTS HUMAN RIGHTS makes no secret that Canadians for Justice and Peace in the Middle East supports this outcome. While Canada does indeed need to clean our own house and really truly address our own truth and reconciliation process, that does not preclude standing up for civil rights elsewhere. I am proud to be a member of the only major Canadian political party to stand up for social justice in Israel. Today is Earth Overshoot day, which means that today humanity has used up the amount of resources that the planet can reliably provide us renewably for the entire year. It moves several days earlier each year; in 2015 it happened on August 13th. The official website makes a number of suggestions for ways that you can make a difference. The idea that we can continue to demand ever more each year from a planet that isn’t getting any bigger is more than a little nuts, so maybe it’s time to stop taking the word of economists about it.